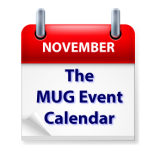 The long Thanksgiving holiday weekend in the U.S. saw many groups jugging their meeting schedules one week earlier or later, but there are still some great presentations this week on The MUG Event Calendar. The Mac Observer’s Bryan Chaffin will talk Apple at one California group, while another will host Tap Zapp Software, talking about their database application. A Florida group will look at CarPlay, and a Michigan group will talk about home automation using HomeKit.